A kindergartner travels through a portal to a fantastic and eerie new world. This story appears in Ellen's collection WICKED WONDERS. This episode is sponsored by Sierra Club (www.beyondcoal.org/stories), Bona Floor Cleaners (www.bona.com), Calm (www.calm.com/LEVAR), and The Great Courses (www.thegreatcoursesplus.com/LeVar). A martial arts instructor meets his match. "Kwoon" appears in Charles Johnson's collection DR. KING'S REFRIGERATOR AND OTHER BEDTIME STORIES. 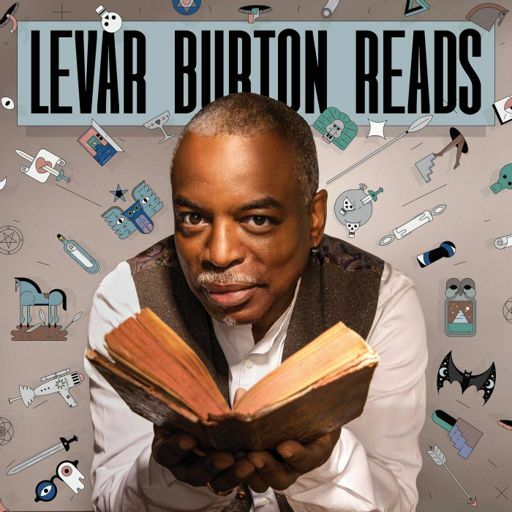 LeVar Burton Reads Returns April 2nd! All-new journeys await you in Season 4 of LeVar Burton Reads. Your daily life will seem light years away! Hear a sneak peek of "Miracle" now. A fantasy tale about a royal family, a flower seller, and a shocking discovery. Recorded live at the Majestic Theatre with musical accompaniment by Zhenya Rock. This episode is sponsored by Calm (www.calm.com/LEVAR). While suffering through a breakup, a woman encounters a strange figure. Recorded live in Austin at the Paramount Theatre, with musical accompaniment by Peter Tran of Curved Light. Two people reconnect in a post-apocalyptic world. © 1984 by Gardner Dozois. Originally published in OMNI. Used by permission of the author’s Estate and the Estate’s agents, the Virginia Kidd Agency, Inc.
For a humble shopkeeper in Yiwu, it’s a living, selling lottery tickets. Until a winning ticket opens up mysteries he’d never imagined. A Rosh Hashanah service is interrupted by voices clamoring for attention. This story appears in the forthcoming collection THE NEW ORDER. A brooding young man is captivated by a magical creature who dances in the firelight. This story appears in JACKALOPE WIVES AND OTHER STORIES by T. Kingfisher. In a future version of Los Angeles, a woman and her ragtag crew must repair a critical piece of technology or let the city burn to the ground. A reporter travels to Miami to investigate the fringes of science and faith. This story appears in THE ASSIMILATED CUBAN'S GUIDE TO QUANTUM SANTERIA. Two teenagers deal with family issues... and a stranded sea creature. Today, a special bonus episode featuring a wide-ranging conversation between LeVar and Lesley Nneka Arimah, author of "What It Means When a Man Falls From the Sky". A sneak peek of “LeVar Burton Reads,” coming June 13th!